Islamabad: At a graceful ceremony in Konya, Turkey on Wednesday, the Mayor of Konya Metropolitan city Tahir Akyurek and District City Nazim Multan Faisal Ahmad Mukthar signed a protocol to declare Konya and Multan as sister cities. Foreign Minister Shah Mehmood Qureshi, Foreign Minister of Turkey Ahmet Davutoglu, Governor of Konya Aydin N. Dogan and Ambassador of Pakistan to Turkey Tariq Azizuddin alongwith other dignitaries from both the brotherly countries were present during the signing of the protocol, said a message received here. The framework document indicates the ‘sister cities’ Konya and Multan officially focusing on the areas covering the partnership. The Mayor of Konya Metropolitan city and District City Nazim Multan signed the protocol on behalf of their respective cities strengthening the relations in areas of culture, arts, economy, education and sports. The document reads that periodical programmes will be organized in Konya and Multan cities every year related to Hazrat Shams-i-Tebriz (RA). Foreign Minister Qureshi thanked the government and people of Turkey for their cooperation and support in every test and turmoil. He also pointed out the historical, cultural and spiritual similarities between the cities of Konya and Multan. The Foreign Minister of Turkey assured that the relations between Pakistan and Turkey will further strengthen after signing of this protocol. Konya is a city in the Central Anatolia Region of Turkey. It is the capital of the Konya Province and had a city population of 1,412,343 in 2007, while the provincial population (including the other urban centers in the Konya Province) was 1,959,082 in the same year. The tomb of Hazrat Maulana Jalal al-Din Muhammad Rumi (RA), the great Persian Sufi poet commonly known as 'Ya Hazrat Mevlâna' also exists on the soils of Konya. The tomb of the great saint, who is the founder of the Sufi Mevlevi order (known for the Whirling Dervishes) is located in the heart of Konya city where he spent the last fifty years of his life. 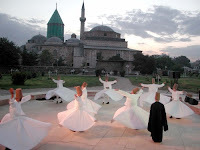 Yet another great Sufi saint, Ibn Arabi, visited Konya in 1207, and made it as his eternal abode. And, Multan is a city in the Punjab Province of Pakistan. It is located in the southern part of the province. Multan District has a population of over 3.8 million—according to 1998 census—and the city itself is the sixth largest within the boundaries of Pakistan. It is situated on the east bank of the Chenab River, about 966 km (600 miles) from Pakistan's coastal city of Karachi. 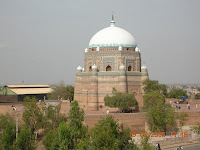 Multan is known as the City of Saints and Sufis due to the large number of shrines and great Sufi saints from the city. The city is full of bazaars, mosques, shrines and ornate tombs. It is located in a bend created by five rivers of the Punjab province. Multan, Pakistan: Shrine of Sheikh Rukn-e-Alam. A small correction: Shaykh Ibn al-'Arabi did not make Konya his "eternal abode". His grave is in Damascus. A foremost disciple of the shaykh, i.e. Sadruddin Qonavi, died in Konya. His shrine can be found in Konya. Thank you. I had a hunch that (what the article states about Shaykh al-Akbar) it was not correct.